On 28 January, two cargo ships collided outside Tamil Naduâ€™s Kamarajar Port in Chennai, causing an oil spill that has now spread upto 35 km to the south along the coast. The port authorities were caught unprepared, and the volunteers were found removing the sludge manually using large buckets. India has not learnt the lessons from the 2010 Mumbai Oil Spill, the environmental damage from which is still unfolding. The ship BW Maple (UK flag), an LPG tanker, rammed the petroleum tanker Dawn Kanchipuram (Indian flag) at 17kmph (nine knots), just two nautical miles off the Kamarajar Port at Ennore near Chennai at 4 am on 28 January. The collision ruptured the water ballast tank and a part of the crew cabin, while also snapping the fuel pipeline. Heavy fuel oil began to leak into the sea even as Ennore port officials sprang into action. No injury or casualties were reported. Port authorities claimed that no damage was done to the environment. 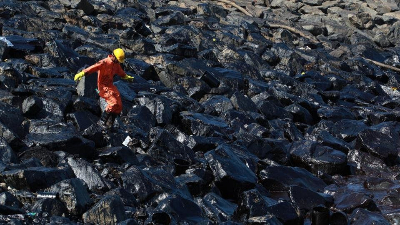 But over the next few days, the oil spill damage became clear as fishermen in Ennore, Kasimedu and nearby fishing harbours reported huge patches of oil slick floating by the seashore. Officials have been studying the impact of the spill on the marine life. 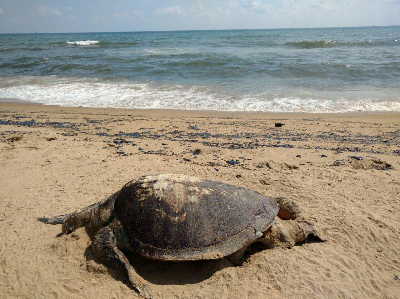 While a section of the sea water had blackened post the spill, some turtles were found dead near the north Chennai shoreline. Pictures of birds and fishes covered in black mass too emerged from the scene. The two ports in the city, including Kamarajar, are not enough to handle the rush of vessel activities in Chennai and such disasters can be repeated again, say experts in the field. 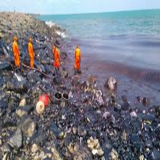 Though the authorities tried to play down the incident, the oil spill that spread to the entire city coast could not hide the incompetence of the authorities in containing it. Why does it indicate lack of disaster-preparedness of India? After initially denying any spill, the port authorities said 200 litres had leaked. The figure was amended to one metric tonne, then two-three, and finally, the Coast Guard released a more worrying assessment - 20 tons more to be cleaned up. The actual leak may be much more. 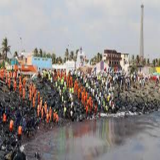 The cleanup work on a war footing is being carried out in several areas, including the Ennore shoreline, Marina and Elliotâ€™s beaches by multiple agencies including the Coast Guard along with the help of volunteers. While the government authorities say the damage is not excessive, all those who make a livelihood out of the ocean, including fishermen and environmentalists say, it is heavily polluted. Environmentalists also tag this incident as one of the worst such incidents in recent times. This disaster is reminiscent of the 2010 Mumbai Oil Spill. Two cargo ships collided off the Mumbai coast on August 7, 2010 causing an oil spill that spread quickly through Maharashtra's coastline.MSC Chitra ruptured its tank when it hit incoming MV Khalijia and ran aground at Colaba, near Prongs Reef Lighthouse. The vessel contained about 1,200 tons of fuel oil in its tanks of which 800 tons spilled into the Arabian Sea before the leaks could be plugged two days later. Environmental damage could not be prevented because India was caught unprepared for a disaster of this kind and of this scale. 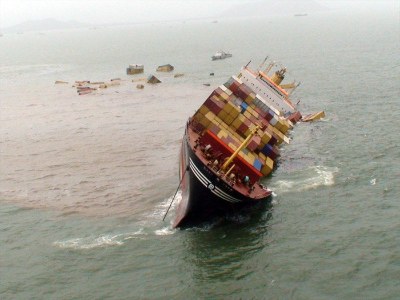 It was not even clear how could the government make the two shipping companies compensate for the clean-up cost. The contingency plan was only and truly on paper. Only one document dealt with the subject â€” the National Oil Spill Disaster Contingency Plan (called NOS-DCP) of 1996. The document was issued by the Ministry of Defence in 1996; it was last updated in March 2006. 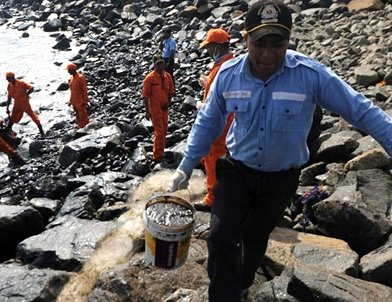 The Mumbai oil spill exposed lack of preparedness of the port trust; it could provide no help to the Coast Guard. The Jawaharlal Nehru Port Trust that shares the Mumbai port's navigational channel was of no help either. The coast saw another terrible disaster in 2013 when a gas pipeline off the western Mumbai coast spewed at least 1,000 litres of crude oil into the sea. It seems now - with the latest oil spill - that India had not learnt its oil spill lessons in Mumbai. As oil sludge is being removed manually using large buckets, the slick has already travelled more than 35 km and tarred Chennaiâ€™s Marina Beach. Campaigners and fishermen have accused the government of being slow to contain the damage from the spill, the scale of which has only emerged in recent days. â€œWe have tried all kind of technology and found that only manual cleaning is possible. So we have deployed more than 500 people. They are working really hard,â€� M.A. Bhaskaran, chairman of Kamrajar Port, told reporters. â€œThe key thing is not technology but honesty. You need to reveal the true extent of the damage, otherwise it leads to a false sense of complacency. With oil spills long-term effects are certain,â€� an environmental activist and volunteer captured the fault of the government aptly. When can this spill cause environmental damage? An oil slick causes damage through physical contact, ingestion, inhalation and absorption. It usually gets into the food chain. It contaminates planktons, which in turn contaminate all who feed on them. Oil can kill eggs and larva. Exposure in adult fish leads to reduced growth, changes in heart and respiration rates, fin erosion and reproduction damage. Toxic effects of oil can also kill larger animals.Sea turtles are vulnerable when they swim to shore for nesting. Birds that float on water get oiled and lose the ability to fly or dive. They also ingest or inhale oil on their feathers while grooming, causing immediate death or organ damage. Oil also hampers the water repellency of feather and fur, leading to hypothermia (abnormally low body temperature) in birds or sea otters. This spill may spell disaster for the Olive Ridley turtles. Olive ridley turtles are best known for their behavior of synchronized nesting in mass numbers, termed as the arribada. In general, these turtles are solitary, preferring the open ocean. They only come together for nesting. From January to the end of March, the sandy shores of Chennai receive these unique visitors. Chennai beaches have up to 300 nests and each year the mortality rates are very high. 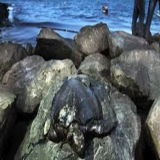 It is not known how many turtles have been affected, but certain pictures showed workers in safety suits removing a dead turtle from the shore this week. As it is, many dead Ridleys had been discovered on the coast last month; most of them dying after collision with the fishing trawlers in the region. If they are impacted by the spill, these treasured guests of Chennai may die in their hundreds. Madras High Court has disposed of a Public Interest Litigation (PIL) petition noting that it's for the Central and the State government to take appropriate steps. Pointing out that an FIR has been already filed against the two ships - MT Dawn Kanchipuram and MT BW Maple - the First Bench of Chief Justice S.K. Kaul and Justice M. Sundar said that the authorities have already seized of the matter and it's for them to take appropriate action, including the aspects of providing compensation and recovering the costs from the owners of the vessels. The PIL moved by National Union of Fishermen, registered in Chennai, submitted its apprehension that the vessels which were responsible for the oil spill might flee away from the territorial waters of India so as to get away from the legal liabilities. Only by detaining the ships the government can effectively prosecute and recover costs from the vessels, which have the responsibility to clean up the mess they have created. The vessels are commercial cargo ships, which are usually insured. It is becoming increasingly likely that strict action might not be taken. Coast Guard IG S Paramesh said the ships involved in collision tried to minimize the scale of the spill. Managing Director of the Kamarajar Port, MA Bhaskarachar said, "It is the vessel's responsibility to report matters correctly. They under-reported and we can't do anything about it". This absolving of responsibility only makes matters worse. Dr Banwari Lal has been working at The Energy and Resources Institute (TERI) on bioremedial methods to clean up oil spills for over two decades. His work focuses on cleaning of crude oil spills and treatment of oily sludge. His team has developed a technology called Oilzapper, a cocktail of different bacteria that feed on oil. This technology, for which the patent is held by jointly by ONGC and TERI Biotech Ltd, was used during the last major oil spill near Mumbai in 2010. Oil is a complex mixture - it contains four major fractions of hydrocarbons. Oilzapper is a patented powder, which is light brown in colour, that is a cocktail of four different bacteria that degrade these hydrocarbons. 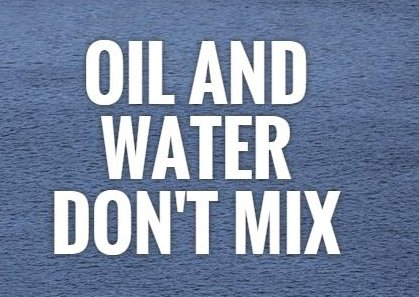 In the sea too, there are bacteria that feed on oil. Many of these bacteria are slow, so TERI selected few that are faster and more effective.Once the oil is finished they too die because their food is gone. Oilzapper was used successfully during the 2010 oil spill near Mumbai. Because of rough seas, the oil had spread over a large area and on many beaches. The powder can be used both on the sea and also on land. Note: Only after efforts have been made to physically remove the oil do the authorities resort to chemical dispersants.Most dispersants are man-made chemicals and some are toxic. There are now regulations across the world that mandate using environmentally-friendly dispersants.Oil floats on water because of high surface tension, dispersants work by reducing the surface tension between oil and water. So oil would dilute and spread or it will fall to the ocean floor. How has the theoretical framework for such issues evolved? Government approved the National Oil Spill Disaster Contingency Plan (NOS-DCP) in November 1993, designating the Indian Coast Guard as the Central Coordinating Authority. In 2015, the Coast Guard comprehensively revised the NOS-DCP to meet international standards, setting up an Online Oil Spill Advisory system that places India â€œamongst a select list of countries that have indigenously developed capabilities for prediction of trajectory of oil spills, mapping of environmental sensitivities in coastal zones, deployment of aerial dispersant spray system and facilitating the regional oil spill contingency plansâ€�. The same year, India ratified the International Convention on Civil Liability for Bunker Oil Pollution Damage, 2001 (Bunker Convention) which ensures adequate, prompt, and effective compensation for damage caused by oil spills. Since 2011, in collaboration with the government, Oil Spill India (OSI) â€” an international forum on oil spill prevention, preparedness, response and restoration systems â€” has been showcasing the best practices, technologies and experiences on oil spill management. Their 2016 Mumbai summit focused on the theme of â€œCommitment, Synergy, Excellenceâ€�. Authorities just put everything in place, on paper. And yet, a long-term marine disaster is unfolding off Ennore coast. Despite the sluggish response of the concerned authorities, it may not be still too late for significant damage control. 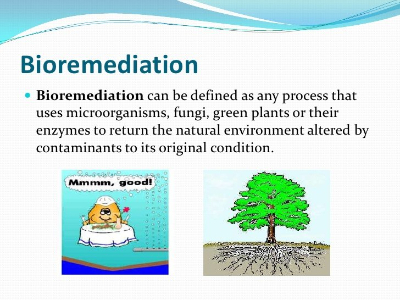 There are several technologies for containment and removal that depend on the nature of the spill and prevailing natural conditions. Now under pressure, the authorities should not be in a hurry to declare the cleanup operation complete. 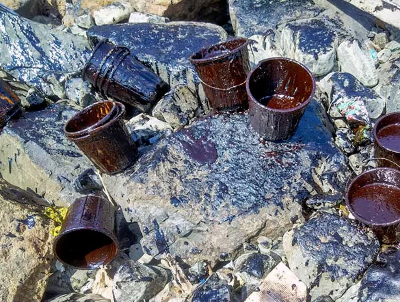 Spilled oil can persist in a natural system for a very long time and recovering every possible bit of it at this stage is crucial for marine wellbeing.